Contrary to popular opinion, there is hardly any satisfaction in delivering a negative review of a film, any film, even if your only hope is to dissuade others from wasting their time. Generally speaking, movies are movies, books are books, and plays are plays – they rarely translate intact from one medium to the other, and most often fail to appeal outside the specificity of their form. Movies are not books or poems, they are not stage plays or any such derivative; movies are movies and as such must be cinematic, engaging, and create an opportunity to experience stories and characters living truthfully under imaginary circumstances. Sadly, Tyler Perry’s film For Colored Girls never transcends the original play For Colored Girls Who Have Considered Suicide When The Rainbow Is Enuf, by Ntozake Shange, buckling instead beneath the weight of posterity and self-importance. Thankfully, the title was shortened though the material did not benefit from such refinement. The fundamental problem with this film is structure; and the title so others have written. But it is the way the story unfolds and consequently how we are shown the lives of the characters that is by and large most problematic. From the very beginning it is apparent that this is not a film at all but a matchstick framework corralling the trappings of a stage play that bares little resemblance to formal structure or structure, for that matter, of any kind. The film is adapted from the 1974 play, described as a choreopoem, whereby dance and poetry is used in conjunction to create a highly stylized, at times excessively melodramatic, container for long-winded monologues, tangled metaphors and dream-speak best heard than witnessed. Where the original work benefits from the intimacy and confined space of the theater it falters on film, so sluggish and disorderly as to propose order against better judgement to the contrary. Films are not allowed the benefit of an ongoing, foretelling narrator to stitch torn and random into meaning – though some try and few succeed. It is from the precision of plot that story is born, nurtured, and delivered. Without it films come undone, they flounder because there is no room for lackadaisical dialog or unnecessary for the sake of unnecessary no matter how poetic or beguiling or sentimental. For Colored Girls gets lost looking in on itself and forgets that the audience is watching with bated breath for a way in, for meaning. As a film, the material presents as cold and detached, a collection of individual characters connected in some way that is slowly, painfully revealed over the course of 134 minutes. 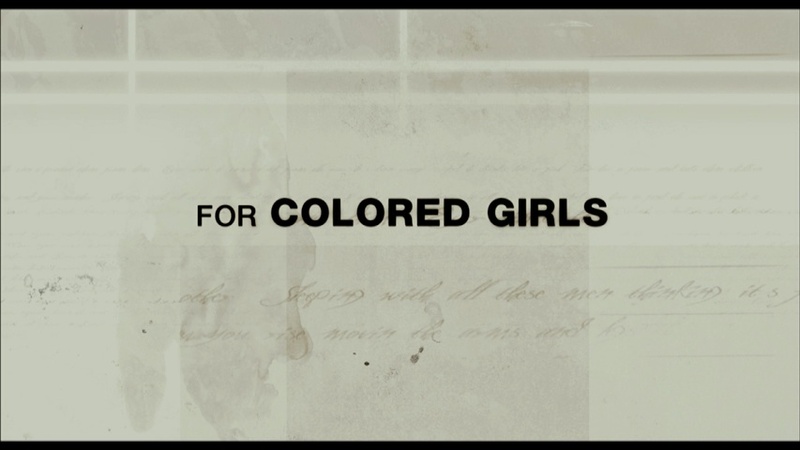 As a film, For Colored Girls is vapid and airy, a run on sentence of sentences, a poem that lasts too long or not enough to connect the dissimilarities or make sameness matter for something. For the material to operate as a film would require the very thing it seems to resist the most – namely, structure. Of course it does not help the film that the characters rarely interact so much as they talk at one another and when they aren’t doing that they are assaulting one another. Even the most interesting dynamic of the film, the shared apartment building that allows for the best opportunity for engagement is all but a plot device where people bump into one another but rarely long enough to know why. Choreopoem is the term used by Shange, an African-American woman and self-described black feminist, who wanted to create a new art form that countered traditional Western (and white) poetry by focusing on creating an emotional response within the audience rather than relying on plot, characters, and structure. The result is an award-winning play, yet for all its accolades, the work struggles in translation to the screen. Watching For Colored Girls is challenging enough with eight central characters and a dizzying pace, voice over odes, spoken word assemblages, and fractured scenes that feel too much like a stage play not to be a stage play. This approach, however purposeful, keeps the audience at arm’s length, a spectator no more moved to emotion than kept from it. The only time the characters truly interact is physically, often brutally, and the monologues emphasize the distance between rather than the connection to one another. Ensemble films are inherently problematic when it comes to keeping the audience engaged, knowing who to follow and why and without a scorecard we are never given an opportunity to know these women – but that may be the point. If the intent of the work is to be representative of all colored girls this might make better sense, creating caricatures in place of emotionally developed individuals as a means of transporting the audience from their seats into any myriad of experiences. 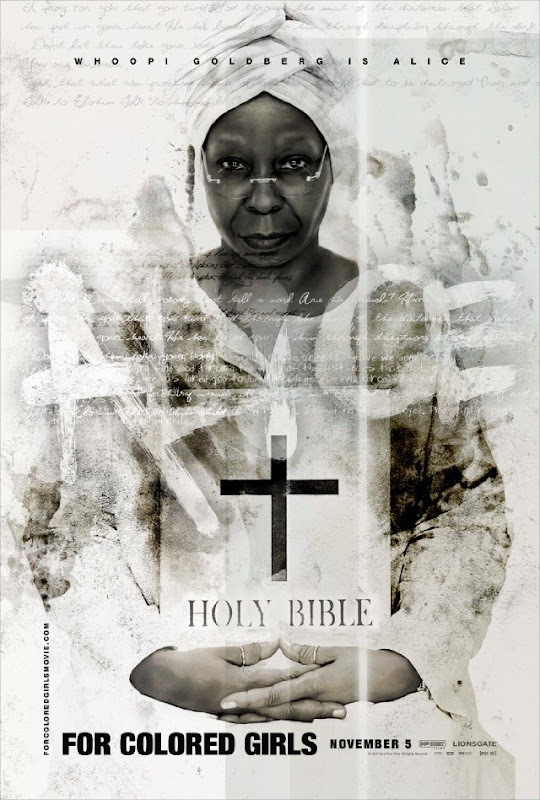 If the intent was the opposite, I would suggest it fails in this respect, offering characters who are singularly one-dimensional – Janet Jackson’s angry and alone executive, Whoopi Goldberg’s obsessive mother with good intentions always at arm’s length, or Loretta Devine who tries and fails at the most basic of relationship connectivity. If the original work was meant as an experiment or simply antithetical, perhaps this was the one element that did translate to the film but in this case rather than avant-garde and inspiring the film takes itself too seriously or not serious enough for clarity and broad appeal – characteristics any film strives for and often fails without. For Colored Girls is neither an ode to nor celebration of the original play and while it proclaims to, “paint an unforgettable portrait of what it means to be a woman of color in the modern world” it feels more like the convoluted outline to the important film it might have been. The scenes border on ridiculous and sacrosanct, testimonials to personal suffering made public where anyone who has ever endured tragedy or joy might relate regardless of the color of their skin, their people, or their ancestry. The painful truth is that Tyler Perry didn’t embrace this. Given the significance of the original work and the enormity of the talented women of color who were brought together to tell these stories, it is a shame the end result is no more salient than a movie of the week or the most hurriedly, shabbily written poem scrawled on a cocktail napkin. This entry was posted in Movie I've Seen, Movies You Should or Should Not See, On DVD and tagged above the line movie reviews, alexander gruszynski, anika noni rose, choreopoem, for colored girls, for colored girls who have considered suicide when the rainbow is enuf, janet jackson, kerry washington, kimberly elise, lionsgate films, loretta devine, movie reviews, movies 2010, movies of 2009, ntozake shange, phylicia rashad, practical movie reviews, rory dean, thandie newton, tps presents, tyler perry, whoopi goldberg. Bookmark the permalink. Kind of bummed – was looking forward to this one. Well, I’m not saying this is a film no one should see as I’d like to think all films have a home somewhere, but it simply doesn’t stand up to the rigors of moving from a stage play (one which I have not seen) to a film, given all the requirements films should adhere to in order to provide a cinematic experience. Given the material, and my own interest in the theater, I would love to see a stage production of the material but at the the same time, I simply cannot in good faith as a filmmaker and movie reviewer recommend that anyone sit through what amounts to a shabby production. I would like to know this movie more because for me the is too much going on 2 keep up!…..